June 16, 2018 (York, PA) – 2017 Fast Plastic Texas Open champions Cloud9 arrived at MAW Wiffle Wars with a different roster than last October, but the result was exactly the same. For the second time in as many tournaments, the boys in blue and white took home a title in a highly competitive, double digit team, fast pitch tournament. For Cloud9, the road to a second straight tournament title was not without its challenges. The tournament champions were tested all day long, but overcame the rest of the field thanks in no small part to the excellent pitching and clutch hitting of tournament MVP, Sean Steffy. Cloud9 arrived in York looking different then the last time we saw them and it wasn’t just the new tank top uniforms. Instead of Ty Wegerzn and Kevin Norris, Steffy and Ed Packer were joined by Tim McElrath and Devin Torres. The two longtime Palisades WBL players not only provided Cloud9 with additional offense, they gave the team an additional pair of arms to throw in pool play games. While Torres and McElrath differ from Norris and Wegerzn stylistically, it would be a stretch to argue that there was any substantial drop off in production. Cloud9’s day began with a near upset. Facing the Ridley Park Longballs Red team and their ace pitcher, Sean Bingnear, Cloud9 failed to score through their first four trips to the plate. 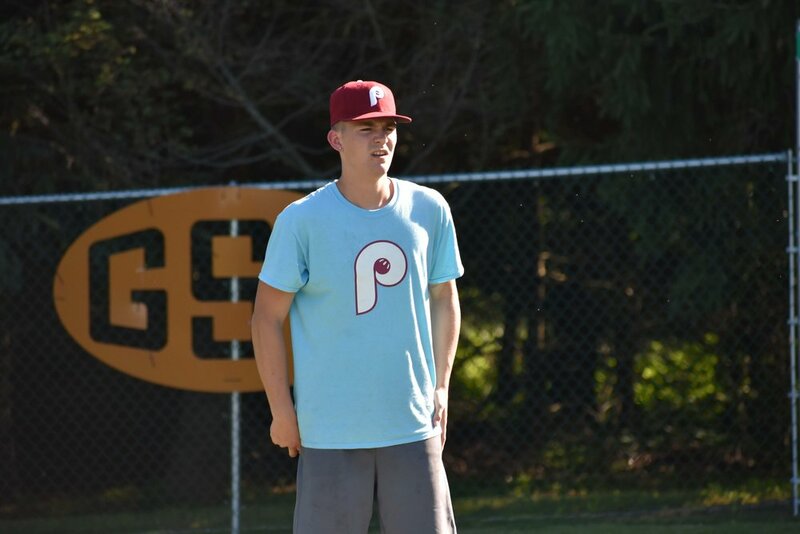 Bingnear – who turned heads with a great playoff run in the Ridley Park Wiffle Ball League last season and continued to do so with a stellar MAW debut back in May – kept the Cloud9 offense off balance all game. Through the first four innings, only McElrath (double and fly out) was able to put the ball in play against the impressive young righty. Packer kept the game scoreless, working out of a bases loaded jam in the bottom of the fourth. With Longballs Red ahead on total bases and two outs already in the inning, Bingnear needed only to avoid an extra base hit from Steffy to end the game. Instead, he left a screwball up in the zone, which Sean pounced on for a solo blast. Just like that, Cloud9 had the lead. Packer held on to it with a 1-2-3 bottom half to complete the escape act. 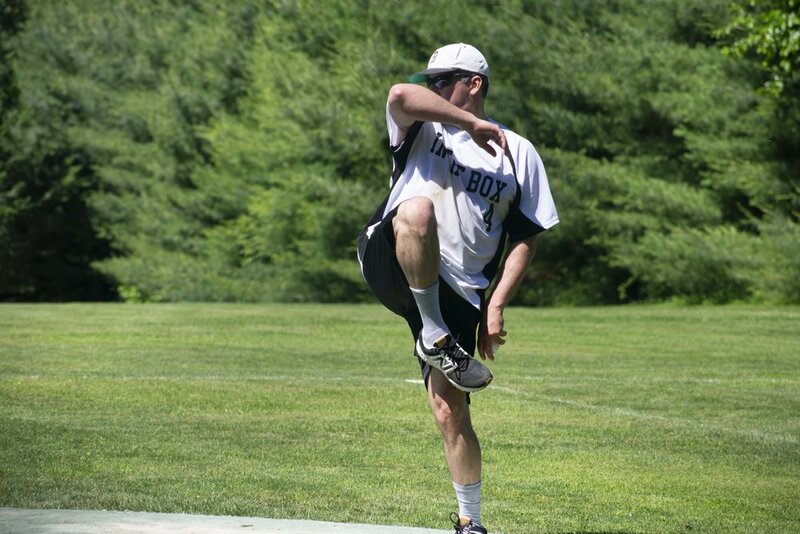 Sean Bingnear (Ridley Park Longballs) goes into his windup. Bingnear continues to impress everywhere he pitches, holding both Cloud9 and In the Box to two runs over nine innings. After making easy work of the InHumans with Tim McElrath on the mound, Cloud9 handed the ball to Devin Torres to face the Stompers. The Stompers came into the game with an identical 2-0 record, thanks to Nick Schaefer and Chris Sarno who picked wins against Longballs Blue and In the Box, respectively. Like their opponents, the 2017 MAW champions chose to hold back their ace (Jordan Robles) for the elimination round and gave the ball to Sarno who was working his second straight game. Cloud9’s Torres worked around a bases loaded threat from the Stompers in the middle innings and the game headed to extras scoreless and tied on total bases. A walk to Sarno in the bottom of the 5th broke the deadlock, however, giving the Stompers the victory on total bases. For Sarno, the total bases victory was another accolade in an impressive resume he is putting together this season in MAW. Sarno has positioned himself alongside the Yaks’ Dan Potter and ERL’s Connor Young as the early top contenders for regular season MVP. As it was in Texas when they worked their way through a total base win and a pool play loss on their way to the title, Cloud9’s goal at Wiffle Wars was simply to make it to the elimination round so that they could hand the ball over to Steffy. With the ball in the hand of arguably the best pitcher in the country, none of the hitting struggles and close calls from earlier in the day seemed to matter much. In an immediate re-match with the Stompers, Steffy went head to head with Robles in a heavyweight pitching matchup. With a spot in the finals on the line, Steffy overpowered the Stompers offense the entire game and did not allow a single hit over five innings of work. Robles was up to the challenge early, but a series of cracked balls wrecked havoc with his rhythm. Usually unflappable on the mound, Robles never seemed completely comfortable, allowing a couple of hits and a walk during the first four innings. In the 5th, he uncharacteristically walked two batters before allowing a backbreaking two run hit to Steffy. The Stompers went quietly in the bottom of the inning and Cloud9 punched its ticket to the title game. Awaiting Cloud9 was My Name is ERL. 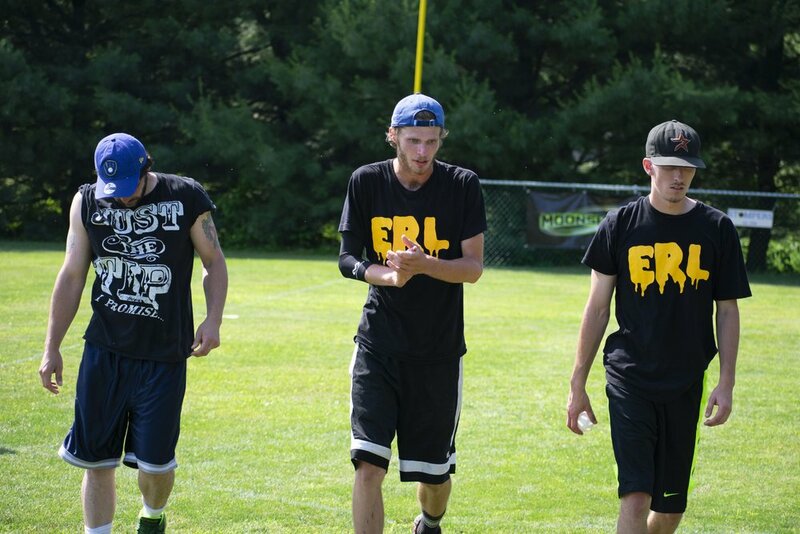 ERL came to Wiffle Wars with a streamlined three-man lineup of Connor Young, Dan Whitener, and Gerard Fitzgerald. While both Young and Whitener are perfectly capable of taking the ball at the end of the tournament, the decision to pitch Connor in round robin and Dan in the finals was an obvious one. Few pitchers are as durable as Young and few pitchers in the game have as electric stuff as Whitener. Young more than held up his end of the bargain, winning three pool play games and the semi-final games against the Yaks. 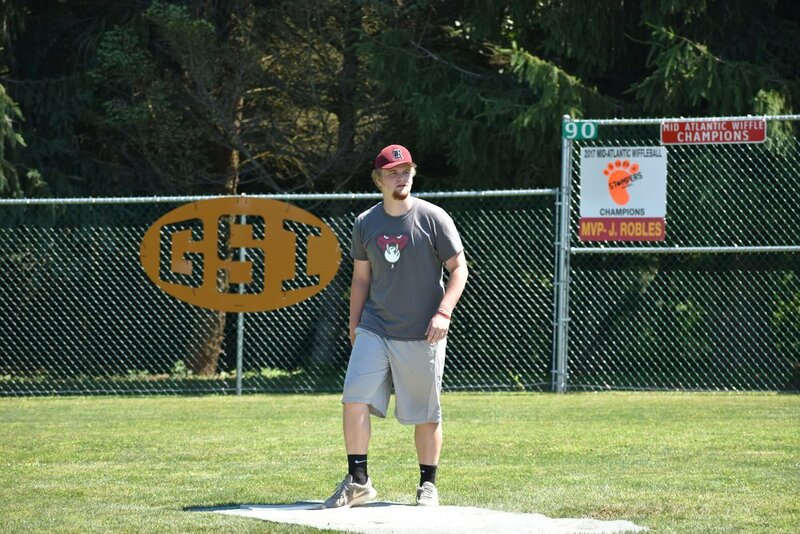 In a post-tournament interview on Wifflecast, Whitener remarked that it was the best he has seen his teammate throw. One might expect given the pitching matchup that the championship game was a low offense, high strikeout affair but that is not entirely true. While both Whitener and Steffy racked up their fair share of K’s, there were several game-changing defensive plays and run-scoring opportunities for both sides. In the second inning, Fitzgerald pulled a grounder towards McElrath on the left side of the infield. The ball ate up the usually shore-handed defender, bouncing off his hands and into the air. Torres – who never stopped running towards the ball from his starting point on the right side of the infield – caught the ball in the air about three feet behind the singles line, pivoted, and through a perfect riser into the backstop to record the out (HIGHLIGHT). Later in the game, a hard grounder off the bat of Whitener seemed destined for centerfield when the ball bounded off the pitching rubber and high into the air. The ball held up just long enough for Torres to field it and record the out. The latter play proved particularly important as it was followed by a Connor Young triple. Young’s hit – which off the bat appeared to have a shot at clearing the short left-field perch – would have scored the go-ahead run had Whitener’s grounder not been corralled. ERL had runners on base and runners in scoring position several times throughout the game, but ultimately failed to convert on any of those opportunities. The homerun held up as Steffy put ERL down in order in the bottom of the 10th to seal the victory for his team. It was a tough loss for ERL who played a great tournament and – as some of the dozens of championship game onlookers noted – outplayed their title game foes in several facets of the game. The tournament marked ERL’s first appearance in a regular season tournament championship game since a loss to the Yaks last August. ERL has not won a MAW tournament since their Mid Atlantic debut last June. Cloud9 pitchers did not allow a single run all tournament long. Sean Steffy – who certainly looked a lot like one of the best players in the country on both sides of the ball – was named the tournament MVP. While teams like the Stompers and Cloud9 had plenty of pitching options at their disposal, the same could not be said for two other teams in the tournament field. The day before Wiffle Wars, the Barrel Bruisers’ Jerry Hill took to Instagram to show off four newly cut Wiffle Balls and to provide an honest assessment – in #hashtag form – of his team’s chances on Saturday. Little did Jerry know just how much he would pitch. The Bruisers were already down to a two-man squad thanks to prior commitments and back spasms robbing the team of Chris Owen and Tony Manelli, respectively. With Colin Dimitris a late scratch the morning of the tournament, Jerry was forced to handle the entirety of the pitching duties for his two-man team. Hill rose to the occasion, picking up one win and suffering a narrow 2-1 defeat to the WILL Waves, in a game that was decided on a couple of close calls. Jerry continues to improve on the rubber every tournament and gave his best pitching performance on Saturday with his back up against the wall. In his late 90’s heyday, Tom LoCascio of In the Box was known for a left arm that was so durable, it appeared bionic. Playing a tournament nearly every weekend – and often accompanied only by his brother Frank – Tom logged as many miles on his arm as any pitcher in the history of unrestricted pitch speed wiffleball. In May of 1999, Tom became the only known player to finish in the top four of a 16+ team, non-Wiffle Up tournament field by himself. Now 51-years old and in semi-retirement for the better part of a decade, Tom took to the field on Saturday with only his son Gianni behind him. As mentioned in the tournament preview, anyone that knew Tom knew he was coming to compete and win, which is exactly what he did. Relying on a slider, screwball, and the occasional riser – a drop pitch no longer an option from all the wear and tear put on his arm over the years – LoCascio held the Yaks to two runs and then shutout both Ridley Park Red and the Stompers. Tom pitched 12+ innings for In the Box before letting Gianni get a taste of Wiffle pitching in the 5th inning of the game versus the Stompers. Gianni flipped up an effortless slider to the Stomper batters and with some coaching from his Hall of Fame dad, a new generation of In the Box may not be far away. With a second inning strikeout on Jesse (Barrel Bruisers), Connor Young became the first player in Mid Atlantic history to reach the 100 innings pitched mark . . . Opening Day set a high bar for competitiveness with 13 out of 15 games decided by three runs or less. Wiffle Wars was not far behind. Nine out of ten teams picked up at least one win, no team went undefeated, and the eventual champions were pushed to extra innings in three of their five games . . . With no disrespect to Sean Steffy, the player that the other players in the tournament were most impressed with was Tom LoCascio. The consensus after the tournament is that after getting a few more reps at the plate, the leader of In the Box could still be a well above average hitter capable of giving a team one excellent game on the rubber per tournament . . . Tom became the second player enshrined on Sheff Field’s “Wall of Wifflers” to play on the field, joining fellow wiffle icon Billy Owens . . . While several teams chose to hold their ace back until late in the day, the Yaks took a decidedly different approach to the tournament. Jarod Bull – who was held out of the May tournament with a shoulder ailment – started the first two games for his team (both wins) as the Yaks sought to reach the elimination round. Bull eventually ran out of steam in the semi-final, but his early-tournament success on the rubber propelled the Yaks to 10 important Championship Tournament points . . . Kudos to Jesse (formerly of Bachus is My Bro) for teaming up with Jerry Hill on the Barrel Bruisers at the last minute. Jesse had a solid tournament, picking up a few hits and making a couple of fine defensive plays . . . 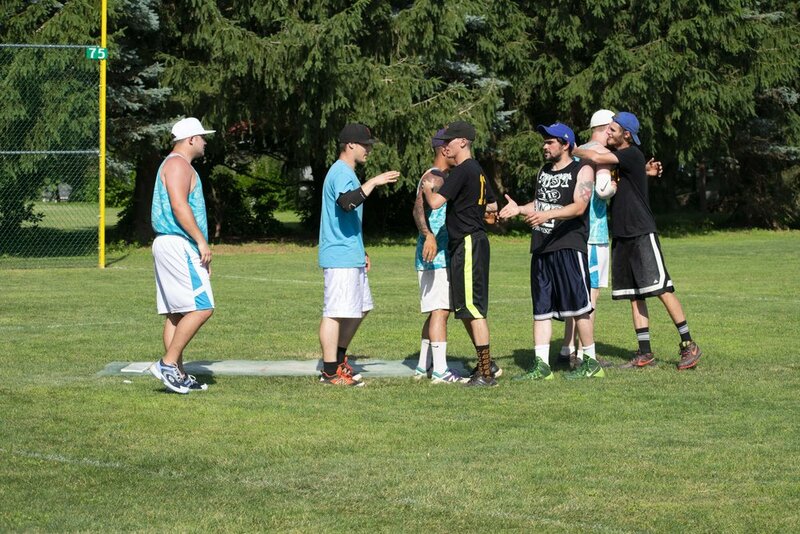 Both Ridley Park and the Wiff is Life League are competing in the NWLA Tournament in Michigan on July 14th. Both teams certainly have what it takes to make a deep run in that event . . . Always a true ambassador of the game, Tom LoCascio supplied all ten teams at the tournament with a FREE Loco Bat. Thanks Tom! We are officially halfway through the 2018 regular season tournament schedule and the Championship Tournament race is heating up! The Stompers and My Name is ERL continue to hold onto the top two spots in the table, although the gap between them narrowed significantly with ERL’s second place finish. The Yaks’ third place finish at Wiffle Wars places the veteran squad solidly in third place. The Barrel Bruisers moved into the top six and will look to build on that with the return of Chris Owen in July. The top six is still somewhat jumbled, thanks to the presence of three teams – New School Risers, Naturals, and Cloud9 – who finished second, second, and first, respectively, in their lone 2018 MAW tournaments. Similarly, the Ben Stant captained G€M is well within striking distance after one tournament played. A respectable finish by any of these teams in an upcoming tournament would position them well for a playoff spot. * Standings reflect all teams with more than 10 points towards the Championship Tournament through the June 16, 2018 tournament. MAW is back in action on July 14th in York for Wiffle Bash! From 1998 – 2000, the Maryland Wiffleball Association hosted their annual summer, Wiffle Bash, in the DC suburbs. Those tournaments saw 49 teams compete over that three-year period with the Georgia Longshotz winning the inaugural event. Baltimore’s Chilly Willy Blasters went back-to-back in 1999 and 2000, beating the Fluffheads and the dynamic duo of Lou Worthington & Mark DeMasi to win their titles. Now Wiffle Bash is back for the first time as a MAW event! Which team will add their name to the list of former champions? July 14th is a busy day for different forms of Wiffle Ball, with the World Whiffleball Championship (slow pitch) in Illinois and the NWLA tournament (baserunning) in Michigan both taking place on that day. There is only place on the east coast to find no pitch speed, high quality Wiffle Ball that weekend and that’s MAW! After July, MAW returns to York on August 4th for Backyard Brawl. This is the last final chance for teams to play at Shi Wiffleball Park during the 2018 regular season! Lastly, MAW debuts in Canonsburg, PA on August 18th with the Canonsburg Classic. This will be the last chance for teams to qualify for the Championship Tournament in September. Spaces are filling up for all three tournaments, so register your team today at www.midatlanticwiffle.com!